Aztlán is an area-control game which looks innocent on the surface but, underneath, there’s the constant lure to sabotage your opponents which can be devastating – which is one aspect that attracted me to the game. 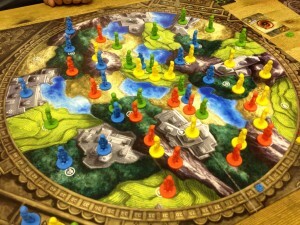 Plus, it’s by Leo Colovini and I find I like his games (Atlantis, Masons, Clans, Carolus Magnus). Each player is an Aztec tribe and the board shows a land divided into territories and each territory has a terrain type (jungle, mountains, etc.) The game lasts 5 rounds (Ages) during which players take turns, and the player with the most victory points (VPs) at the end of the game wins. On their turn, a player must place 1 of their people figures into the board, plus the player can optionally move 1 of their figures on the board to an adjacent region. Figures can be placed in, and moved to, any region even if opponents’ figures are there. Not many figures get placed each round (in a 4-player game, each player places 7 in the first Age and then one fewer each round after that so only 3 figures in round 5).